It is the middle of summer and time for family reunions. Both sides of my family have family gatherings that we regularly attend. Although both reunions focus on relatives gathering together (and good food), there are differences between the Miller and Schumm reunions. The Miller reunion is held every year on the fourth Sunday in July, which this year is the 22nd. This gathering is for the descendants of Carl and Gertrude (Brewster) Miller, my grandparents. At the reunion are my aunts and uncles and cousins. I am not sure when the first Miller reunion was held but I think we started getting together when I was small and my grandparents were still living. One of the earliest reunions that I remember was held at my Aunt Kate and Uncle Paul’s. We gathered for a photo in front of their house. Usually about 50 Miller relatives attend the reunion on Sunday afternoon but many of us celebrate all weekend long. Miller Reunion Weekend begins on Friday evening when about 20 of us get together for dinner, often in Decatur, Indiana. After that we usually go to Uncle Vernie’s to visit, reminisce, look at old photos and enjoy one of Aunt Martha’s delicious desserts. On Saturday several of us go to Celina to browse the sidewalk sales and crafts at Celina Lake Festival. This year that won’t happen because Lake Festival is the following weekend. Saturday evening usually finds us at the Chatt Family Restaurant, aka the Chatt Bar. The big decision there is whether to order breaded tenderloin, deep fried pizza or regular pizza. For me that decision is easy. I always order the breaded tenderloin and deep fried dill pickles. The actual Miller reunion is on Sunday afternoon at the park in Willshire, Ohio. There is always plenty of good food, catching up on the latest news and looking at more photos. For many years we had the reunion at the park in Berne, Indiana, but changed the location to Willshire a couple years ago. They have a nice shelter house at Willshire and there is usually a nice breeze from the west. Except for last year when it was very humid with no breeze. I refer to that reunion as “The Hot One.” The Miller reunion is all about visiting, looking at family photos, seeing how much the little ones have grown and eating. 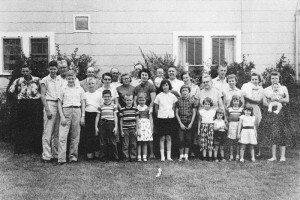 The Schumm reunion is held every two years on the first Sunday in August. This year the reunion will be held on 5 August. The first Schumm reunion was held in 1924 at the Schumm homestead, northwest of the church. I remember for several years it was held on the Ned Alspaugh property. Recently it has been held at the pavilion just south of the church. The Schumm reunion is for the descendants of John George Schumm and his five children that immigrated to America with him in 1833. It is a much larger reunion than the Miller reunion and is a little more structured. In fact, they elect officers. There are many, many Schumm relatives and we wear name tags at this reunion. Name tags also indicate from which of John George’s children we descend. Years ago the average attendance at this reunion was 450. Today about 150 attend. Schumm reunion day begins with the 10:00 church service at Zion Lutheran, Schumm. This year they will dedicate John George Schumm’s Bible during the church service. The Bible was donated by the W.J. Schumm family. A carry-in meal commences after church in the pavilion just south of the church. There is a lot of very good food at this reunion, too. I am fortunate to descend from a line of very good cooks on both sides of my family. I’m afraid the line broke when it got to me. I just don’t have that love of cooking. The afternoon portions of the Schumm reunion is more structured than the Miller reunion. They conduct a business meeting that begins the afternoon program at 2:00. There is an agenda and the meeting includes reports from the secretary and treasurer as well as the discussion of new and old business. Entertainment follows the business meeting. The past few years a singer/comedian from Fort Wayne has performed. The program concludes with the Schumm chorus singing “The Lord Bless You and Keep You.” The Schumms enjoy music and many are talented singers and musicians. Of course people stay and visit after the program is over. I helped compile and update the Schumm history and genealogy that was made available in 2010. This year I have asked that people bring old Schumm photos. I will take my Flip Pal and Magic Wand scanner and scan photos all afternoon. I plan to make the photos available as a slide show on CD or a thumb drive for the 2014 Schumm reunion. Hopefully most individuals will be identified in the photos but I will have an unidentified section for the unknowns. Maybe sometime someone will be able to identify them. 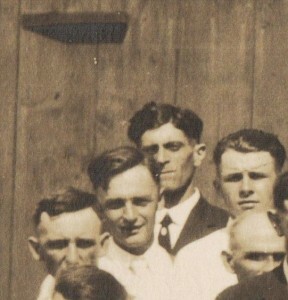 My grandfather, Cornelius L Schumm (1896-1986), 1924 Schumm reunion. Back row, far left of above photo.. There is another reunion that I could [and should] attend. The Brewster reunion is held yearly, usually on the Sunday after the Miller reunion. I hate to admit it, but I rarely attend this reunion. There is just not time to do everything, but I think I will go this year. I have an ulterior motive. I want to take my DNA kit over and get a DNA sample to see if we descend from the Mayflower Brewsters. I’ll see if I can get someone to volunteer to donate a few cheek cells for the test. And, Brian, if you are reading this, I will bring some new “old” Brewster photos for you. Hopefully you plan to attend. Now I need to sit down and look through my recipe books and decide what to make for the upcoming reunions. My mother was a Schumn. I live just north of Chattanooga on 707. My mothers name was Virginia. We grew up around Rockford on a farm on Erastus Durbin road. My fathers name was Jesse Crabtree. My grandmother was Molly Schumn near Rockford. Yes, we are related! If you have a sister Sheryl, we went to Parkway together. And my mom knows your family. Be sure to come up and say hello if you come to the Schumm reunion. My cousin Karen from California sent this website to us. And then I saw that Dennis had a reply. My cousin is not a Schumm (from the Crabtree side) but she does genealogy. I am Dennis’ and Sheryl’s sister and live in Rockford. We take care of our Aunt Lucille who was a Schumm-daughter of Charles and Molly and sister of Virginia and Herbert. If it is not to hot, we we will possibly bring Lucille to the Shumm reunion. She is 87 years old. That would be great. Be sure to introduce youself at the reunion. I would love to meet you. We will be gone until the day prior to reunion, but we do plan on attending. I have a few things for you as well. Will be good to visit. The DNA sounds fun, you’ve got a volunteer. Would be glad of any info you may have. What is the date of the reunion? Is it the last Sunday in July or the first Sunday in August? If it is the first Sunday in August it will conflict with the Schumm reunion! If that happens I’ll make other arrangements for us to get together. Thanks for volunteering for the test! Always first Sunday in August. Have not received the invitation yet. My Aunt Mary usually sends them out. We will have to make plans. Hi Karen. I googled ‘Schumm Reunion’ and your site came up. Thanks. Lots of interesting information. I lived next to Zion Lutheran Church (in the big, brick parsonage) from 5th grade through high school. My dad, Pastor Schuler, was pastor there from ’69 to ’81 or ’82. He and my mom are in the Cleveland area now, but he will be the guest preacher at Zion on Sunday, August 5th. I’m flying in from Colorado for the weekend. Karen, your name sounds very familiar. I too went to Parkway….graduated in ’77. What year did you graduate? You spoke of Chatanooga, where you live. My friend, Mary lived in Chat so I spent a lot of time there over the years at her place. Her dad was the pastor at the Lutheran church there. And the Chat Bar? Oh yes, I remember it!! Looking forward to Sunday! Maybe I’ll see you there! What a small world! Was your friend Mary Hershberger? Her father was pastor at Zion Chatt about that time and he married us! Be sure to introduce yourself at the reunion Sunday. I wish I could attend the church service at Schumm on Sunday but I play the organ at Zion Chatt. I will be there for the meal and afternoon program. See you Sunday! Yes, Hershberger is the name! It really is a small world! See you soon.